Verification ensures that the system (software, hardware, documentation, and personnel) complies with an organization’s standards and processes, relying on review or non-executable methods. 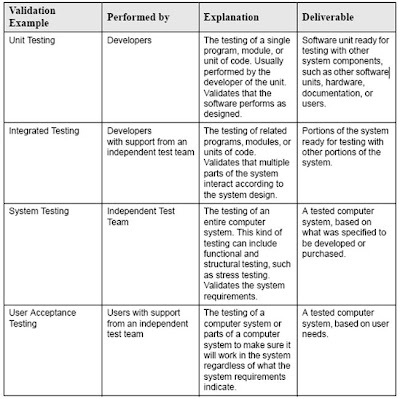 Validation physically ensures that the system operates according to plan by executing the system functions through a series of tests that can be observed and evaluated. Verification requires several types of reviews, including requirements reviews, design reviews, code walk through's, code inspections, and test reviews. The system user should be involved in these reviews to find defects before they are built into the system. In the case of purchased systems, user input is needed to assure that the supplier makes the appropriate tests to eliminate defects. The fallowing table illustrates the examples of verifications. Validation is accomplished simply by executing a real-life function (if you wanted to check to see if your mechanic had fixed the starter on your car, you’d try to start the car). 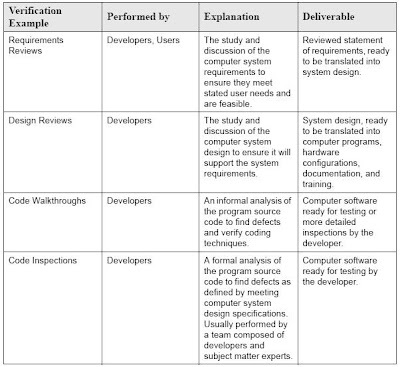 Examples of validation are shown in Table below. 1 • The corrections will probably be made using the same process for developing the software. If the software was developed internally using a waterfall methodology, that methodology will probably be followed in making the corrections; on the other hand, if the software was purchased or contracted, the supplier will likely make the correction. You’ll need to prepare tests for either eventuality.